It is logical that from a fantastic house candies, such as Nougat Sirvent, where tradition and art of creating this great Christmas sweet you can get to feel in each of the bars of nougat, the idea is promoted and the concept of buying artisans candies, always emphasizing the concept: ‘craftsmen’. And it is that all that glitters is not gold, right? Following this adage, not all candies sold in Barcelona and many other shops are artisans. When we go to buy a nougat, if we want to eat a quality product, we must be quite sure that this product made by hand and traditionally. In Nougat Sirvent Barcelona, as we say in our articles and each and every one of our validated products, we follow a procedure of preparing the traditional and handmade nougat, and that only in this way can be guaranteed high quality of a product is the star like nougat. 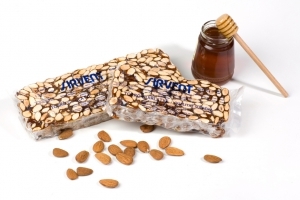 Nougat for us in Barcelona Sirvent, each of nougat bars is a way of expressing our talent in this sector of sweet. And this gastronomic expression could call her culinary art. And, the working hours to devote to a particular type of nougat, and to mix the ingredients, turn up the temperature, let stand, the whole process … is art, an art that we can see by looking at a bar of nougat Sirvent. 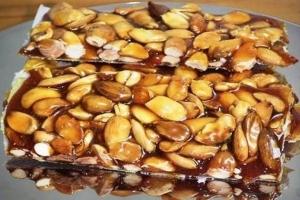 The artisan nougat, is for much of society, the flagship of the festive season, it is a spectacularly rich sweet and rich not only in appearance but in product quality and especially rich in the propiedades and health benefits . For many shops, the nougat is a product shelves over the holidays, and not give more importance than it does get to all; It is that many people during the holidays gather around the tables, and end meals, eating nougat and polvorones. We work to be there on the table, and for people to enjoy the most, with this spectacular sweet. Why buy a handmade product? We must all be aware, that all people ever want to eat better, this shift has created a new trend, craft products are increasingly sought after and popular. But when the term “artisanal” I begin to use large manufacturers of food, we entered the doubt if it really is pure marketing or is truly handmade, and as we have explained before, the big companies do not care about nothing more than place and replenish products on the same shelf, nougat and the product does not escape this vicious cycle of consumerism and the desire to sell more and more of it. If we cycled through large supermarkets and not so great, we will find all kinds of products with the label “handmade product” and we can ask how a multinational, with thousands of units of this nougat, you can make this nougat craft? And the answer is usually negative, and is part of a marketing campaign or just advertising. When we think of artisan food, we imagine a person, or a team, preparing sweets in a small oven, jams, including bags, or in this case: nougat. An artisan does his work with art, does not produce large quantities and always works using traditional methods. Which entails that these processes suelan be slower, on this basis alone, that product is impossible (temporarily) that can mass produce; and that small ‘defect’ for many large companies, make them more difficult to achieve, and so much more special nougat really craftsmen (and usually more expensive than other products that are not handmade tad). But good lover and nougat, one of the most important things that handmade product is always a nice story behind the life of the master nougat and his team is hidden, that is what enriches even more this fantastic handmade nougat . It is very important that when we go to buy an artisan product, first read the ingredients, if you have preservatives and dyes obviously has nothing craft. And then another factor to consider is the color. Artisan nougat color varies from what is not actually that is very dependent cooking time, the more time has cooked the darker. Even you lost the initial color of the fruit or nuts if it contains, because you do not like industrial dyes. Do you think that this product has really value what you do? 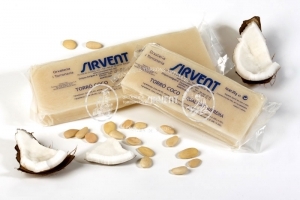 Is this product really artisan, it is made in small quantities, and special natural ingredients? The artisans are artists. Does it reflect the product that passion, tradition and the process that tells his story? Above all Can you get to have a relationship with the person who made the product, and who I want to buy? Nougat Sirvent in Barcelona on all these issues, as you will suppose, would answer in the affirmative, is that the artisan product is the best way to enjoy this product and nougat is an example of all this philosophy of value creation in gastronomy Christmas.Cheers and enjoy your meal with artisans candies!